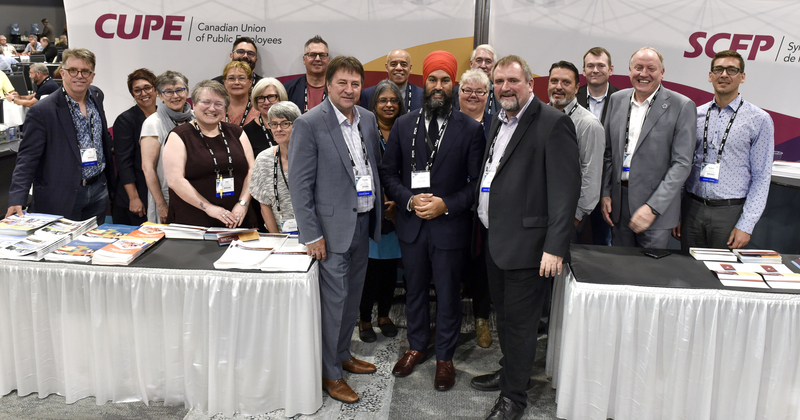 In early June, members of CUPE’s National Executive Board and staff attended the annual meeting and trade show of the Federation of Canadian Municipalities, held in Halifax. It was the largest meeting the FCM has ever held, with over 2000 mayors, councillors and other municipal officials from across Canada in attendance. As part of its presence at the meeting, CUPE hosted a panel session titled, “How Accessible Public Services Protect Human Rights.” The session highlighted many of the creative ways that municipalities – and municipal workers – support human rights by providing and defending strong public services. The panel was moderated by Prabha Khosla, an urban planner and scholar, who framed the discussion as a celebration of good work and a tool kit for other municipalities. The panelists, from three very different Canadian cities, discussed how public services are a necessary condition for many of the most vulnerable in our communities to participate in society. Sue Montgomery, Mayor of Côte-des-Neiges-Notre-Dame-de-Grâce and Deputy Mayor of Montreal, described the importance of adequate and affordable housing for lower-income and new Canadian populations. Toronto City councillor Kristyn Wong-Tam discussed the importance of bringing a gender-responsive lens to city budgeting, and how to break through bureaucratic inertia to get there. Catherine McKenney, an Ottawa city councillor, told the story of the pop-up overdose prevention site in Ottawa, and how an unsanctioned site was eventually licensed and funded through the hard work of advocates and workers. The subjects raised by this panel discussion, and the numerous conversations the session generated over the course of the FCM meeting, are particularly relevant for CUPE members.